← Barton Hills Whiz Kids! Talk about rocking the house! A 10,000 ton rock from space roused about 1000 houses when it exploded over the Russian town of Chelyabinsk early in the morning of February 15th. It may have arrived on planet Earth a few hours late for Valentines Day, but not because it wasn’t trying. Travelling at over 30,000 miles per hour, that rock was definitely in a hurry to get here! Instead of spreading hearts and roses, this express delivery exploded into a brilliant fireball, not so romantically called a ‘bolide’. It blazed across the sky for 30 seconds or so, and then showered its remains across the Siberian plain for children to find in the snow. 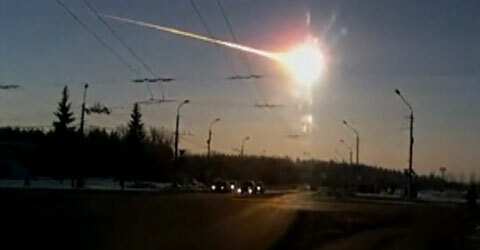 Lucky this meteor was made of rock not iron. Instead of exploding high above the surface and scattering relatively harmless pebbles, a meteor composed of iron or other metals might have held together and crashed into whatever lay in its path. Fifty thousand years ago that’s just what happened. A nickel-iron meteor, roughly the same size as last week’s fireball, survived the fall through the atmosphere and gouged a mile wide divot in the Earth’s crust still visible today. This entry was posted in Earth, Meteors. Bookmark the permalink. Glad you liked it, Bella!